A Handicapped Service Foundation - the one and only one non profit, non governmental service organization working in the town of Khammam. AHS Foundation runs the only Deaf, Dumb & Blind School of the district. The school is located at Mustafa Nagar, in the out skirts of Khammam town. Currently there are 165 Blind, Deaf & Dumb students undergoing specialized training under integrated education program - to lead a normal life along with other students. A handicapped Service Foundation was established by the founder Y. Lalu, in 1990. He hails from a poor family of 3 brothers and a HI (Hearing Impaired) sister. He was searching to admit his sister into a deaf school, but could not find one. He found the need to have a school for hearing impaired in Khammam. Since it is going to be a service to disabled children in the area, he wanted to start a school immediately. Due to his untiring efforts, the Government of Andhra Pradesh extended integrated education to Khammam district in the year 1990. AHS Foundation has been established in the year 1993 and started a Hostel for Deaf and Blind children with effect from Jan 01, 1993 for the welfare of Hearing Handicapped, Visually Handicapped and Handicapped with physical defects at Mustafa Nagar, Khammam. Since then the Foundation has been participating in numerous Government programs like Janma Bhoomi, Pulse Polio, Tree Plantations, Family Planning Operations, Construction of Sanitary Latrines and Bore Wells with irrigation facilities. The foundation is also providing Hearing Aids to Deaf Children, Walking Sticks to Blind Children and Tricycles to Physically Handicapped Children. Our AHS Foundation has been established in the year 1990 and started a Hostel for Deaf and Blind children with effect from 01/01/1993 for the welfare of disabled children. 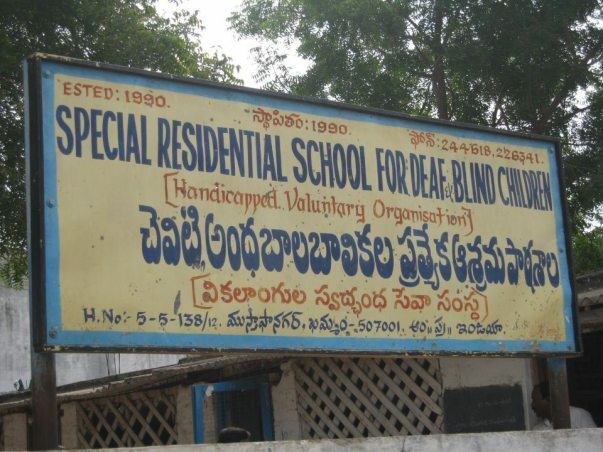 Ours is the only institute in entire Khammam district rendering services to both Blind and Deaf & Dumb Children. Notification for admissions will be publicized every year. The applications received are screened for the percentage of disability. Their certificates are scrutinized and eligible children are admitted to respective school. In addition to the above, our teachers survey villages mandal wise and submit the particulars. There are nearly 450 children in 19 mandals that are surveyed so far. We are developing the education of these children by appointing special Braille education trained and Deaf education trained teachers. We have also appointed one Drawing Teacher for the Deaf, one Music Teacher for Blind and one Hearing Impaired Teaching Assistant. Vide Disabled Act 1995 by surveying district vide mandals and villages we are participating in Janmabhoomi activities to educate disabled persons. If they are aged, we are helping them financially through Government officials. If they are children with visual or hearing defects, we are providing residential education facilities free of cost at our premises. We are approaching donors along with disabled persons for financial help. Many disabled persons are living with the support of donors by taking different professions like supplying Milk, Vegetables and other petty businesses. With the help of donors, many disabled persons are leading normal life in the society. For the welfare of Hearing Handicapped and visually Handicapped our organization has started a School. Simultaneously, a hostel for the said disabled children was also started in 1993. Since the we are providing lodging and boarding facilities to disabled children free of cost. Currently there are 165 students living in our hostel and undergoing education through integrated program. We provide Bedding material, Steel Plates and Steel Glasses to all disabled children studying in our school free of cost. 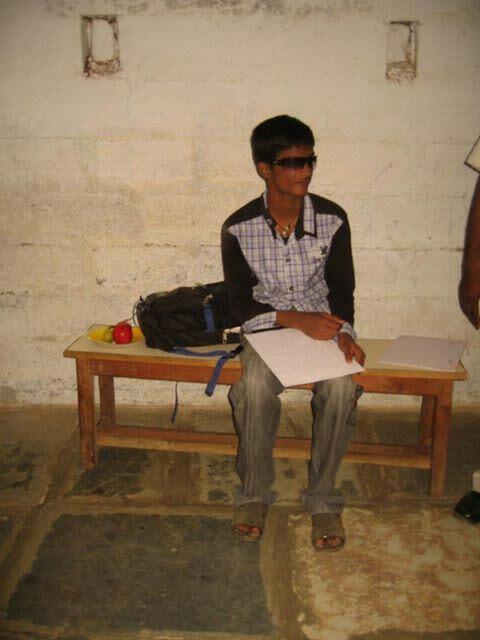 We have appointed well trained teachers to educate the children on Braille and also Deaf education. We have furniture for Braille and Deaf education sufficient for our current strength. We have purchased a Braille Type writer (Godrej) for Blind Children. We have purchased group hearing aids; each having 8 microphones with loop induction system. We are also equipped with Games materials for Deaf and Blind Children separately. Every year our students are appearing for Common examinations from VII to X standard. All of our students are achieving excellent results compared to normal children of their age. With the help of more donors, we plan to increase the strength of our school. We also plan to start more schools providing same facilities in surrounding villages so that we can serve more needy children. Eye Care Camps : Conducting Eye Care Camps in our School and surrounding areas and providing Medical Certificates every year. HIV/AIDS Awareness Camps : Conducting HIV/AIDS Awareness Camps in neighborhood villages. Health Camps : Conducting Health Camps in villages to check up the percentage of Deafness and providing Medical Certificates to Deaf and Dumb people. Celebration of Disabled Day : We are celebrating World Disabled Day on December 4th Every year and conducting Games & Sports competitions for disabled children. Celebration of National Festivals : We are conducting Games & Sports for Deaf and Blind children every year on Aug 15 and Jan 26 and distributing prizes to winners and runners. Child Labour Elimination Program : We are conducting programs on the elimination of Child Labour in 5 mandals of Khammam district of Andhra Pradesh. After identifying child labour cases, we motivate them and their parents to admit them in local Government Schools. Celebration of School Day : We Celebrate our School anniversary every year in the month of April.